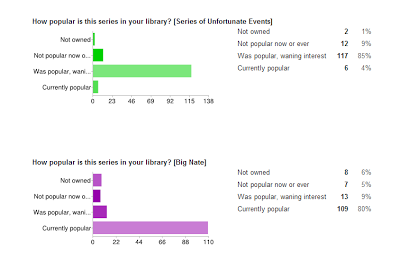 Anne compiled the data on each individual series. 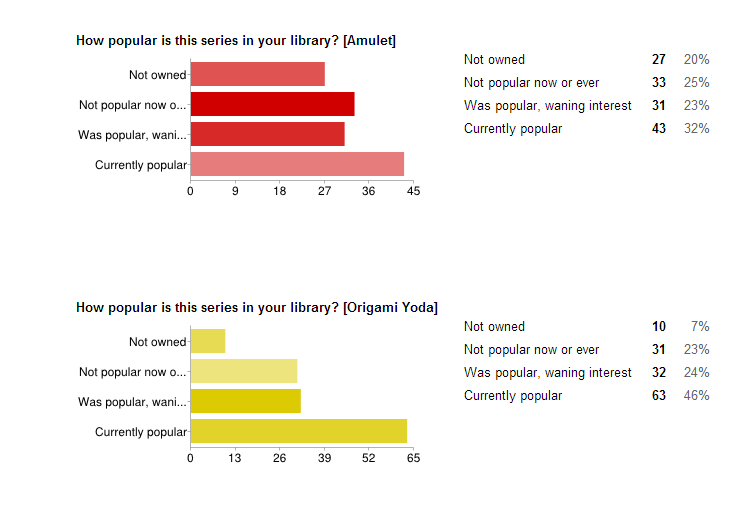 Take a look at the charts below; how do series' popularity at your library relate to any larger trends? Are you missing anything from your collection? Are there series on which I should be offering book discussions or programs? Based on series popularity, what types of readalike booklists should I make before summer reading? What series am I purchasing too many copies of? What series may need replacement copies? 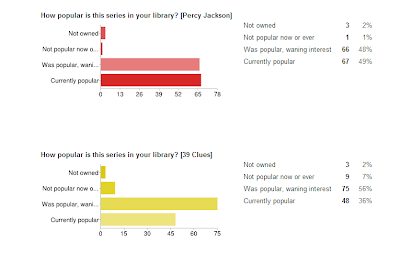 It should be noted that a few people expressed a wish that we had offered more descriptive criteria in Part II of our survey; namely, they wanted there to be an option for a series that saw consistent middling interest among readers. 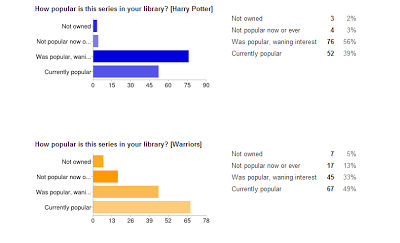 Note that our data will only reflect popularity within the boundaries that we set for the survey. 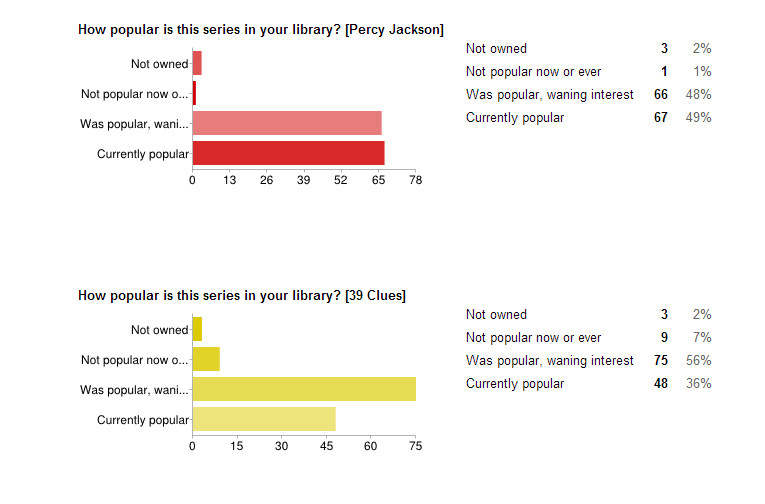 Also, there will always be room for discussion on what it even means for a book or series to be "popular." 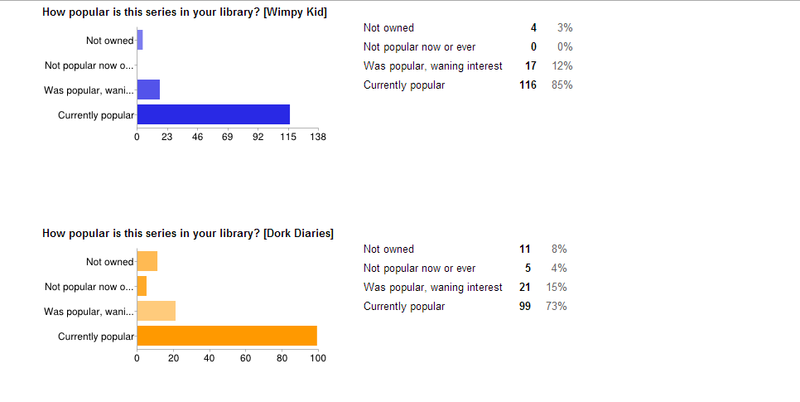 For now, though, I think these data give us plenty of interesting things to talk about. No librarian is an island. That, of course, is my opinion: that good librarianship requires a degree of collaboration, a willingness to learn from others. I know I couldn't do my job well without my peers--colleagues, friends--who open themselves and their expertise to others. The way I see it, there are a lot of brilliant librarians out there, and they all have something tremendous to offer to the profession. Some excel at offering program successes, some at offering service innovations. Some specialize in research and tips on the work we do with kids, which helps me gain intentionality and purpose; some share insightful ruminations on the profession that give me new perspective on what it is I do. I know that I strive to share everything I can about STEAM programming for kids--that's what I would want to be my niche, were I to have one; and while I would not claim to be the loudest or best voice on that topic (I have some really smart peers! ), I do hope I am offering something worthwhile. I want to contribute because, simply, I take a lot from my peers. That is to say, I peer source. Frequently. 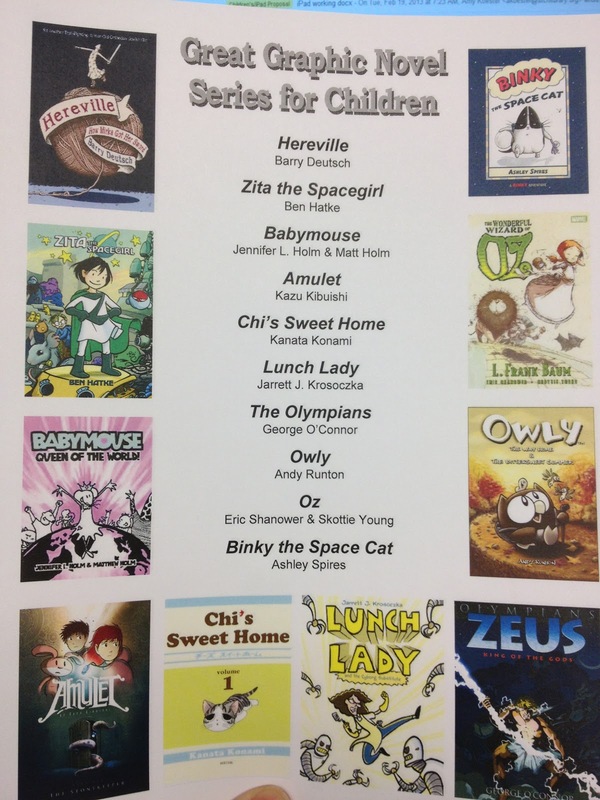 Take my recent initiative to get more kids reading our great graphic novel series; why would I start from scratch in making a top ten list when Hannahlily Smith already shared a stellar one on the Nerdy Book Club blog? Sure, I designed the handout I placed in our graphic novel stacks; but the core of the material came from a peer I consider an authority on the subject. I peer sourced it. I peer source themed book selection for impromptu story times. I peer source genre readers' advisory lists. 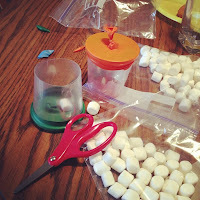 I peer source simple crafts for large groups, and I peer source homeschooling program formats. My library services benefit from all this peer sourcing. Don't get me wrong--I do a lot of original work, as do my peers. But the reason we are able to create so many quality services from scratch is because we look to our peer "experts" to fill in the gaps where we may not always be so successful or confident on our own. We look to and learn from the know-how of others. The way I see it, that's an exemplary work model: services are top-notch, staff are developing skills and working efficiently, and children benefit. I'm proud to be a part of a profession that values collaboration and believes we all have something valuable to offer. 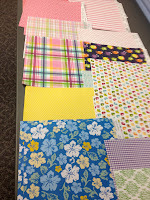 Today's guest post comes from one of my staffers, Miss Erin. She is sharing a preschool story time program that she offered in our library last week. One of my favorite aspects of her program: the Mini Marshmallow Shooter STEAM craft! Engineering + Arts, with fidelity to her theme... terrific! Without further ado, it's Miss Erin! While this book has a story to narrate, I decided to use it for a picture walk. Preschoolers helped me tell a story about a little girl named Emily and her yellow balloon. This story demonstrated counting and subtracting in a fun and repetitious way. Ended up being a great interactive story! 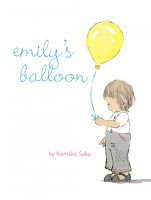 This is a story about a dog,Sally, who goes to a hot air balloon race. While looking at the balloons, Sally smells fried chicken! In an attempt to find the chicken, Sally finds herself in a hot air balloon, alone and floating away. While Sally’s adventure makes the news, all she can do is worry about the fried chicken. Closing Song: "If You’re Happy & You Know It!" Cut the bottom part off of the cup. Tie a knot at the end of a balloon and cut off about ½” from the other end opposite of the knot. Stretch the open end of the balloon over the end of the cup. That’s it! You are now ready to launch marshmallows! Each child made two shooters. I had the cups already cut. The children tied the balloons, cut the ends off, and placed balloons over cups. As they were leaving, I supplied them with a baggie of marshmallows and balloon coloring sheets. Today, as part of the build-up to World Read Aloud Day, I'm going to finish some sentences about reading from the perspectives of both my 10-year-old (4th grade) self and my current grown-up self. 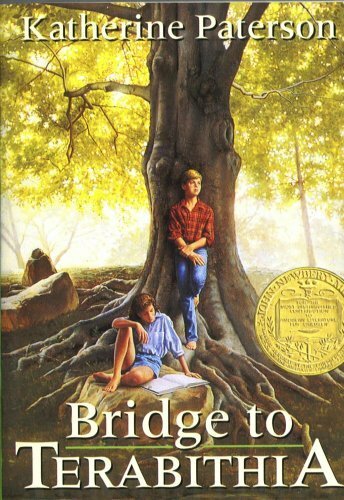 10-year-old Amy: Bridge to Terabithia by Katherine Paterson. I loved the idea of having a Terabithia--a special, secret place to go. I remember scrunching up into a corner of my bedroom and pretending that I needed to use my hot pink electronic Dear Diary in order to access my secret hideaway. The password, of course, was "Terabithia." Grown-up Amy: Three Times Lucky by Sheila Turnage. I especially think that everyone in the world should read this story aloud in order to enjoy the stylistically-perfect language as much as the quirky characters and captivating mystery. 10-year-old Amy: my cousin Stephanie. She lived in New York when I was growing up, which felt very far away from my house in Indiana. I loved when her family came to visit. Stephanie was very theatrical--she would write plays for all of us cousins to perform--and she was always talking about the books that she was reading. Hearing her read aloud would have been a natural combination of her aspirational literary enthusiasm. Grown-up Amy: Neil Gaiman. I was so excited when my best friend Mike told me I could listen to Gaiman read The Graveyard Book online. Gaiman has one of those reading voices that can make the nutritional content of cereal sound magical, and I'd love to hear him read aloud from some of my favorite books. 10-year-old Amy: Sister Bear from the Berenstain Bears books. We had a lot of these books in my house growing up, and when I was ten, I would still read them with my 7-year-old brother. Grown-up Amy: the bear narrator from Jon Klassen's I Want My Hat Back. 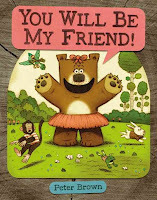 I love doing all of the voices in this book--a slow turtle, a confused what's-that-animal--but my favorite is the bear. I particularly like to say, in my best distraught bear voice, "My poor hat. I miss it so much." It always gets some giggles from listeners. 10-year-old Amy: Newbery Award books. My mother was always happy to buy books for my brother and me, and our school's book orders included great, inexpensive paperback copies of Newbery winners and honorees. I had a great selection. Grown-up Amy: Jane Austen books, both written by her and about her. I know, that's not really a children's librarian thing (although I do own the board book version of Pride and Prejudice! ), but when all is said and done, Jane Austen books take up over 2 feet of bookshelf space in my apartment. I also own four different copies of Persuasion, my favorite Austen novel. 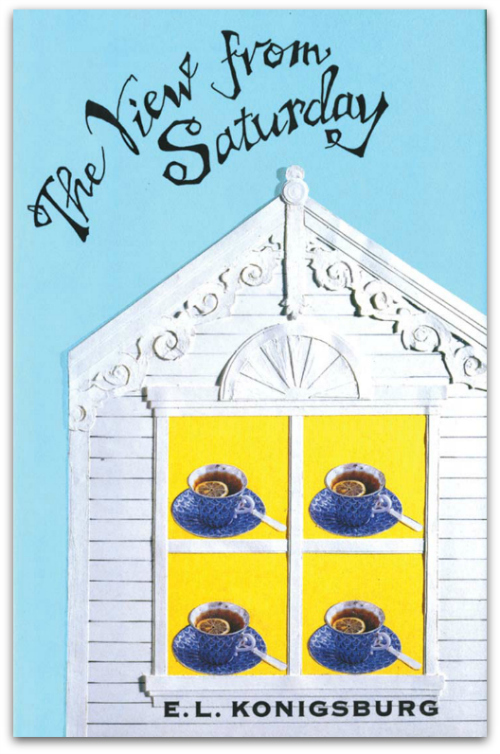 10-year-old Amy: The View from Saturday by E.L. Konigsburg. I was absolutely enchanted by how all of the characters and narratives were woven together, and I was inspired to write my own story, also set at a trivia competition, in the same style. My story was three pages, I think. Grown-up Amy: none. With all of the books that I've read, I have realized that creating stories is not a particular talent of mine. That's not a bad thing, and it doesn't make me sad at all. Instead, I am thrilled that I have a job that allows me to share the work of talented writers and storytellers with children. Do you ever reflect back on what your reading life was like at different times in your life? I'd love to hear how you would have finished these sentences as a young reader! This post is part of the World Read Aloud Day Blogging Challenge, which features weekly blog prompts leading up to World Read Aloud Day on March 6. Stay tuned over the next couple of weeks another WRAD Blog Challenge post and the details on the implementation of my library's WRAD program! I love this story of the new friendship between a boy and a robot and their concern for one another's wellbeing. 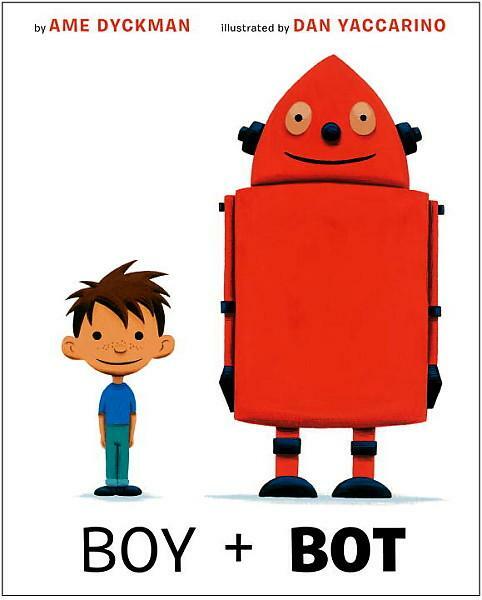 It's equal parts funny and touching, and I love that I get to use my robot voice in read alouds. Another great story about making a friend--and why it's important to be yourself, because you'll find friends who are perfectly compatable with you. We talked about the illustrations a lot during this reading, and we also talked about activities we like to do with our friends. You can't use a big parachute by yourself--you need your friends to help you in order for it to be a lot of fun (see what I did there?). We worked together to make small ripples, rough waves, and, finally, a tent that we could sit inside. The kiddos loved the parachute so much that they asked to do it again after our craft. I obliged. I love open-ended crafts, especially for programs where attendance can vary. 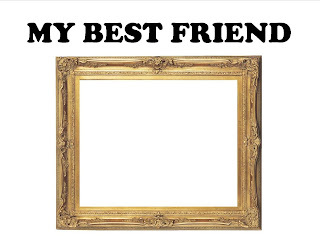 This craft consisted of a white sheet of paper with the words "My Best Friend" and a picture of an empty picture frame; I asked the children to draw a picture of what they like to do with their best friends in the frame. One child drew himself and his friend pretending to be pirates; another drew a picture of himself and his friend on a treasure hunt. Not only does the open-endedness of these crafts facilitate writing--an early literacy practice--but it also provides opportunities for talking about what the children draw/write. That's both talking (another early literacy practice) and ascribing meaning to marks on a page. The big, bold letters at the top also provide perfect fodder for practicing letter recognition. For a rather simple paper-and-crayons craft, that's a lot of early literacy impact. My story time friends and their caregivers certainly seemed to enjoy themselves! 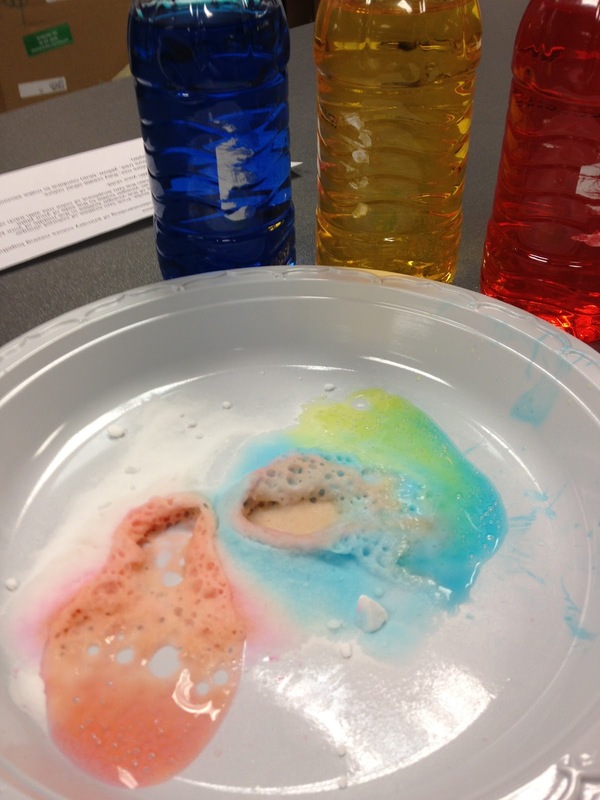 I'm on the ALSC Blog today sharing the details of a recent Color Science program I offered for my preschoolers. Head over there and steal my program to use at your library! What's so special about reading aloud? As a children's librarian, I have interactions with children who cannot read, those who struggle to read, and those who voraciously read. Yet whatever a child--nay, a person's--age or reading ability, I've found that people consider it a treat when someone reads aloud to them. Reading aloud connects us all to our cultural ancestry, to a time before ebooks and the printing press and lay literacy, when the only way to tell stories was out loud. Technological developments in the book world haven't dented the human appreciation for stories, and listening to a book read aloud resonates with a fundamental need to connect with the world through words, imagination, and stories. Reading aloud allows us to rejoice in the rhythm and melodious sounds of words. There is such beauty in language, and I love to share that with others. I'll often read a sentence or passage aloud to my coworkers or the children in the library simply because of how beautiful it sounds. Reading aloud gives listeners shared experience. 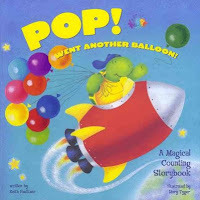 I love to share funny books aloud because group laughter is infectious and momentous. I regularly have classrooms of preschoolers talk to me excitedly about a book we shared months before, simply because the experience of sharing that book was a touchstone for them. I also often take my favorite picture books home for visits to read aloud for friends and family after dinner simply because shared stories are wonderful. Reading aloud together creates strong bonds. Reading aloud is comforting. One of my favorite summer programs is a Book Bunch Picnic Lunch series, where families bring sack lunches to the library and eat an indoor picnic while I read aloud. I love to see just how much older school-age children in particular enjoy listening to stories despite the fact they can read them on their own. Being read to feels safe and relaxing and luxurious. Reading aloud gives us mantras and meanings that enrich our lives. "I think I can, I think I can!" "Let the wild rumpus start!" We internalize the lines and stories that we hear and love; they stick with us. My mother and I can still recite the first several pages of Dr. Seuss's Sleep Book--that's how much we read it together and loved it. And while it may seem amusing that I know an intro to a Dr. Seuss book by heart as a 26-year-old, I would firmly argue my life is better for having bits of books inside my brain. This post is part of the World Read Aloud Day Blogging Challenge, which features weekly blog prompts leading up to World Read Aloud Day on March 6. Stay tuned over the next few weeks for more WRAD Blog Challenge posts, culminating in details on the implementation of my library's WRAD program! 75 of you (!!) responded to last week's survey about what middle grade series are popular in your libraries. Anne and I are thrilled with that response, and now we want to dig a bit deeper. Using the data from Part I, we've identified the 15 series that were named the most--because you said either they are very popular or they are not living up to their former fame. 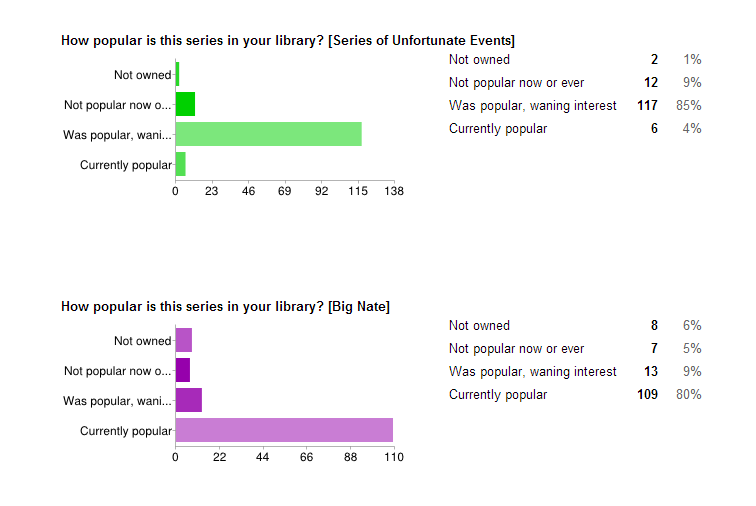 We'd love it if you'd take a few minutes to report on how these 15 series fare in your library. 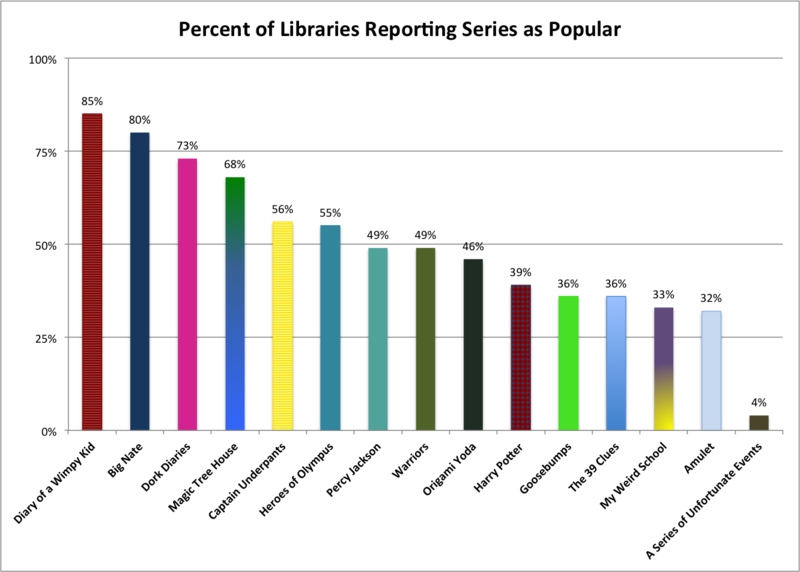 Is one series collecting dust in the stacks while another series overtakes your hold shelf? We want to know, and we'll report back on the findings at the end of the month. I can't wait to see if what's popular with my kids is part of a larger trend. I subscribe to the perspective that we youth services folks have been living out the maker space movement since before it was cool existed as such. We've crafted with our kids since we first branched out from just offering story time programs, and now that crafting fits into the larger, more publicized Maker Movement. 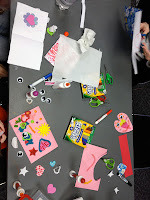 So keep this in mind: while it may seem as though I'm just offering you details of my low-tech, cut-and-paste-and-paint-and-stick Valentine Workshop, I'm really showing you how easy it is to turn your own youth program room into a maker space for an hour. open the program room doors and let the creativity flow. 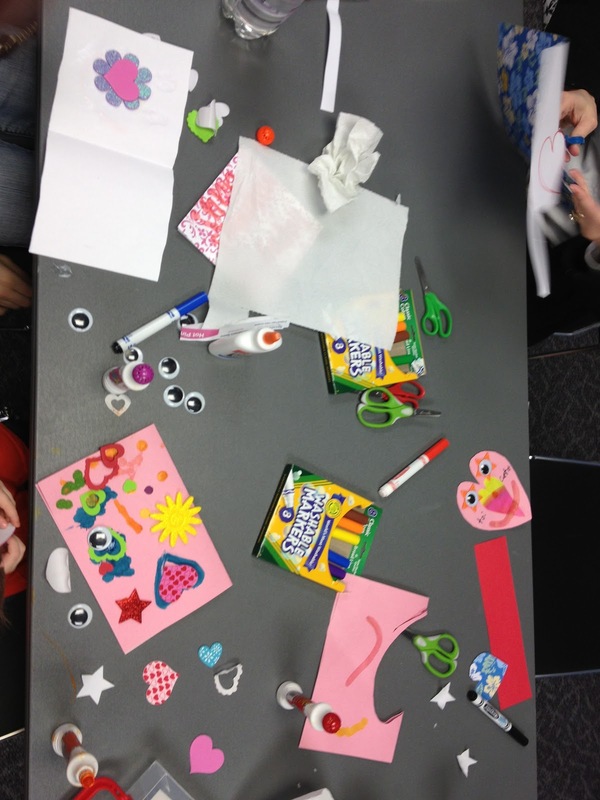 I had about 25 people come through this year's one-hour Valentine Workshop. Yes, that's smaller than my more "programmed" programs tend to be, but the smaller group size meant I was able to circulate the room and talk to every child about Valentine's Day, their creations, and what they've been reading. As I wandered about the room talking to the children, I also got a sneak peek into their processes. 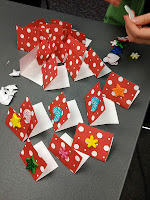 One girl was methodically making matching valentines for each of her classmates; another child was strategically placing stick-on foam stars amidst her poems for her friends; and a boy made valentines that doubled as bookmarks. 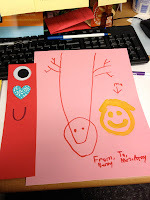 The younger kids experimented with how much glue it takes to get a googly eye to stick (not as much as they think it takes), and then they left with at least one valentine for a family member or friend. The products of our hour were varied, and invariably the makers were proud of what they'd made. They always assume I'm married. When it comes down to it, maker spaces for kids are, in my experience, equal parts about the freedom to build and having a forum to share with others. That's the exact sort of environment I seek to create in my low-tech maker spaces: plenty of supplies for unrestrained creativity, space and time to make things, and companions who are interested in what they're doing. My kids really enjoy the opportunity to relax, get their hands dirty, and make things without rigid instructions. I even got my very own valentines at the end of it. How are you incorporating maker spaces into your youth programming? Have you given the maker movement much thought? Last week marked the beginning of scout visit season at my library. Over the next few weeks, I'll have a dozen troops of young Boy Scouts and Girl Scouts visit my branch for a story, tour, game, and library card. I've talked a bit about the types of scavenger hunt games we have in the library for tour visits such as these. But those scavenger hunts are the finale of the visit; I always start with a story. Some years I focus on storytelling and share a folktale; the oldest scouts in particular (think fifth or sixth grade) appreciate a somewhat scary tale. This scouting season, though, I'm primarily sharing Scaredy Squirrel by Melanie Watt and Here Come the Girl Scouts! by Shana Corey. Ordinarily I am opposed to using one book for a male audience and another for a female audience. This year's scout visits represent a rare deviation from my books-have-no-gender book sharing strategy, though. Why? 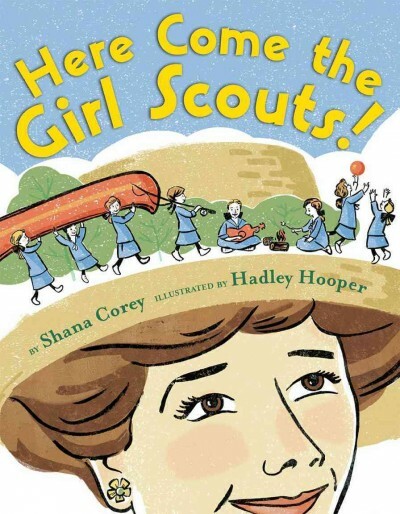 Scaredy Squirrel is always prepared, and the Boy Scout motto is "Be prepared"; and Corey's non-fiction picture book tells the story of the formation of the Girl Scouts organization. 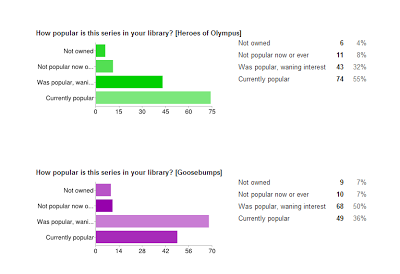 Each book speaks to these specific audiences quite perfectly. Both of these books keep the scout audiences engaged, and I have had more than one den/troop leader ask me how I can keep the attention of a group of squirmy 8-year-olds for 45 minutes from start to finish. What can I say? A good story, the chance to explore a place filled with things to read, watch, and play, and a scavenger hunt around the library can do wonders for engaging kids. 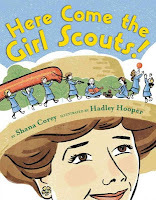 What do you do when scout groups visit your library? 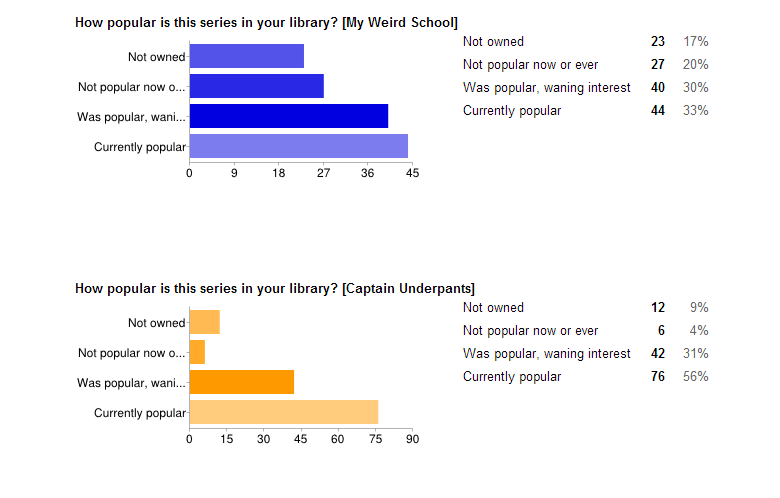 Do you lead more specific badge-earning activities, or is it mostly getting them acquainted with the library? Have you seen Sarah Bean Thompson's Caldecott Storytimes series? 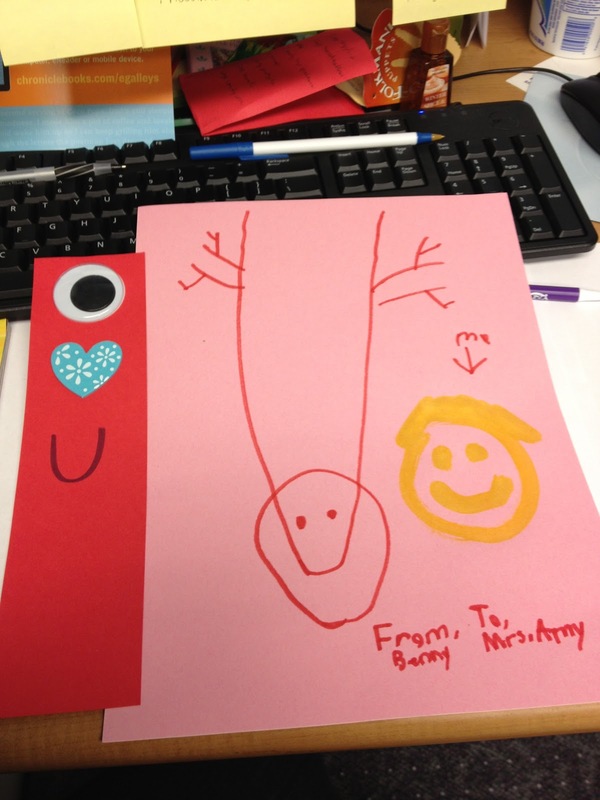 When I saw her latest installment, I decided I had to focus on illustrations in my February outreach. Our local schools are in the midst of Caldecott and Newbery projects right now, so my supplies of Caldecott titles are low, but I grabbed a few other books with beautiful illustrations, all different from one another, and headed to the preschools. Here's how it went. Before I began this first story, I introduced our theme for the day: looking closely at the pictures in books to get more from the story. 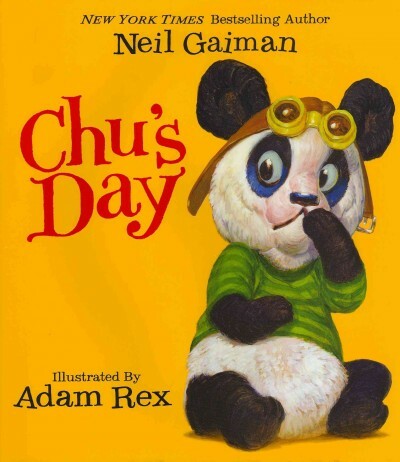 Chu's Day is a shorter story text-wise, but Rex's illustrations add so many layers of richness. I invited children to shout out what they saw in the big picture spreads where Chu is at the library, the diner, and the circus. I included some leading questions to help them see how pictures can fill out details in a story. One example was in the diner spread, where I asked if they could tell who was the chef. We looked for the chef's hat and finally found the whale behind the diner counter. All these small details felt like new discoveries to the kids--discoveries that added to the story. 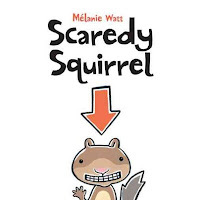 I shared the cover of this book and asked the kiddos if the pictures looked as detailed as our previous story. 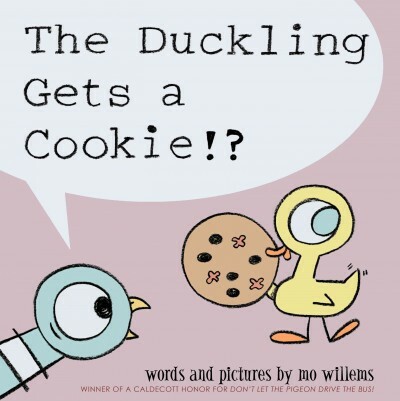 Willems's relatively sparse style adds its own flair to his stories, especially the characters of Pigeon and Duckling. 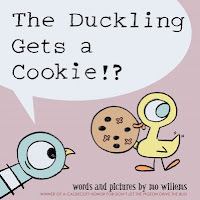 The kids love Pigeon's overdramatic responses to everything, and they particularly enjoyed looking at the spreads where Pigeon rattles on about all the things he's asked for but not gotten. And the black steam/rage cloud above Pigeon's head at one point? They loved that and commented on it. Wiggle Rhyme: "Three Sailors Went to Sea"
Even though I was inviting comments from kids throughout the first two stories, I could tell they were getting wiggly from sitting still. Thus I broke up our session with a wiggle rhyme that Ted from Your Magic Storytime Hat recently reminded me about. We did actions (making waves with our arms for "sea" and putting our hands above our eyes for "see") and repeated the rhyme several times, trying to get faster each time. I think Brown's illustration style represented a great middle ground between Rex's rich detail and Willems's expressive minimalism. 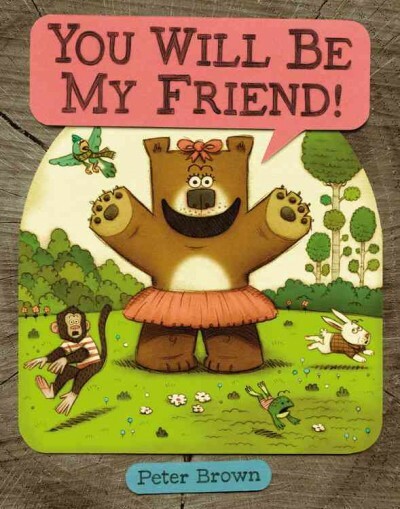 In this story, Lucy Bear is eager to make a new friend--but she has a rather hard time doing that, what with her distinct personality. One of the beauties of this book, in my opinion, is that the pictures are vital to getting the whole story. That fact invites plenty of talking about what readers/listeners can see in the pictures before I turn the page. My kids were really starting to enjoy talking about what they saw, and they fell into a rhythm of knowing when it was time to quiet down so I could turn the page. 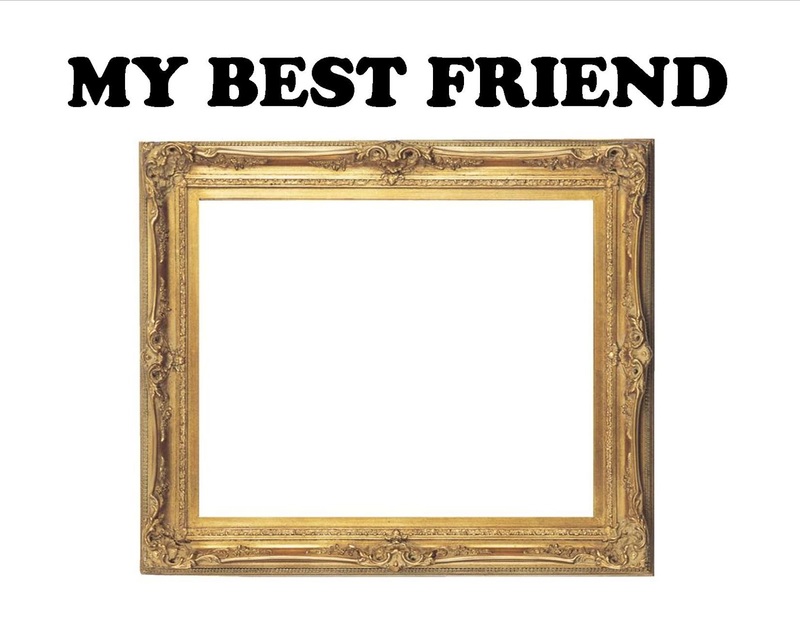 For our last story, we talked about how things in the pictures can hint about what is going to happen next in a story. In this book, Max finds two twigs and decides to make music with them by drumming on all manner of objects. He finds the sticks while his grandfather is washing windows; in the next spread, we see Max drumming on the wash bucket. After his friends show up drinking sodas out of glass bottles, the next spread shows Max drumming on those bottles. By the end of the story, my kids were able to guess what Max would be drumming on next. 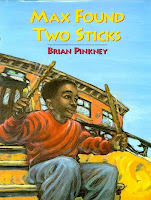 I also really love sharing this story because it can be interactive--I ask kids to stick out their two pointer fingers to be their own sticks, and they can drum and tap along to the rhythms in the text. Lots of fun all around. I always worry that the kiddos are growing tired of ending our story times with this song, but that's not yet been the case. This time I pulled out the ukulele and asked the children to remember some of the animals we saw in our stories to fill the verses of the songs. My favorite was when they wanted to be pandas like Chu--they decided it was best to pretend to chomp on bamboo if you're happy and you know it and are being a panda. What are some of your favorite books to share and talk about illustrations? 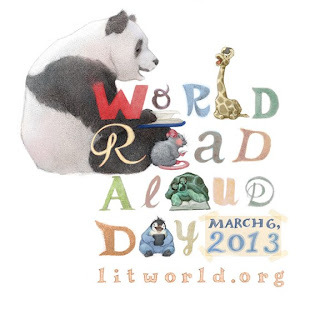 World Read Aloud Day 2013 will take place in one month on Wednesday, March 6. World Read Aloud Day is an event from the folks at LitWorld, and it is a global initiative to draw attention to the prevelance of illiteracy worldwide. Did you know that almost 10% of the world's inhabitants are unable to read? Last year, hundreds of thousands of people celebrated the joys of reading by participating in 65 countries all over the world. My library will be among the many, many sites celebrating literacy this year on March 6. I'm planning an all-day celebration of reading at my library to mark World Read Aloud Day. 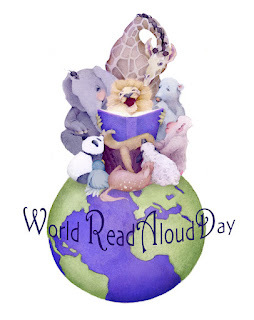 On the half hour of every hour that the library is open (9:30 a.m., 10:30 a.m., and so on through 8:30 p.m.), one of my colleagues or I will announce over the PA system that it is World Read Aloud Day. We'll invite anyone in the library who is interested to join us in Picture Book City, my library's children's area, for a read-aloud story to celebrate literacy. I'm choosing a wide variety of books for my twelve read-alouds: classics, new favorites, non-fiction, poetry, and award-winners will all be represented. 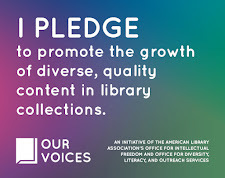 We'll share one story every hour, and after the story is over, participants will hear a quick world literacy fact and be asked to write their names on colorful die-cut books. 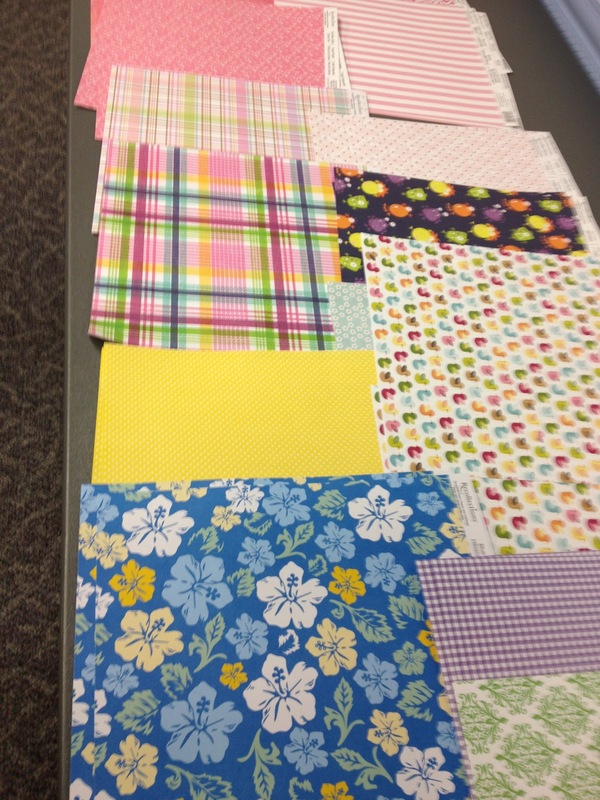 Each cardstock book will be displayed in the entryway of the library. My hope is that we'll have a rainbow of books with names on them in the library entryway to show just how much we support worldwide literacy. Are you interested in planning your own World Read Aloud Day event? Looking for some tips? Head over to the official website to download activities, an event kit, and the event badge. 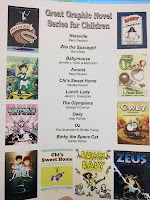 If you've got Skype capabilities in your facility, you may want to connect with authors and illustrators for your event; author Kate Messner is compiling a list of book folks who are interested in virtual visits to classrooms and libraries, and she'll have full info on her blog later this month. Don't forget to register your event on the LitWorld website, too. I hope you'll consider sharing the joys of reading and bringing awareness to global literacy by celebrating World Read Aloud Day on March 6! Anne at so tomorrow and I got to talking on Twitter a few weeks back--she was looking for additional read-alikes for Dork Diaries, and I was offering suggestions for similar series that my kids are enjoying. 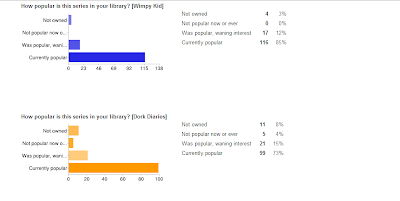 That conversation turned to how series popularity can vary from library to library, and from there we started wondering what kids love at libraries other than our own. And so this two-part survey was born. If you'd be so kind, please take a moment to think about what middle grade series are most popular with the kids you serve. There's no need to check circ stats--just name some titles off the top of your head (or look to your hold shelf!). Data collected from this survey will inform the next step in our exploration, with a culmination of series popularity info on our blogs at the end of February. Thanks for sharing what your kids love reading! When I saw the Angry Birds Live! programs shared by the likes of Future Librarian Superhero, Bryce Don't Play, and Teen Library Toolbox, I knew I needed to add that program to my schedule of upcoming events. They made it sound so easy, so much fun! So I started saving book boxes and asked staff to bring in all manner of recyclables for building the towers, and the kids of a library employee offered to donate the use of their Angry Birds stuffed pillows for demolition duty during the event. I figured I would round out the projectiles with some of the tactile balls I use in baby programs, and we'd use our miscellaneous-print fabric to toss the birds at the towers. Simple enough. 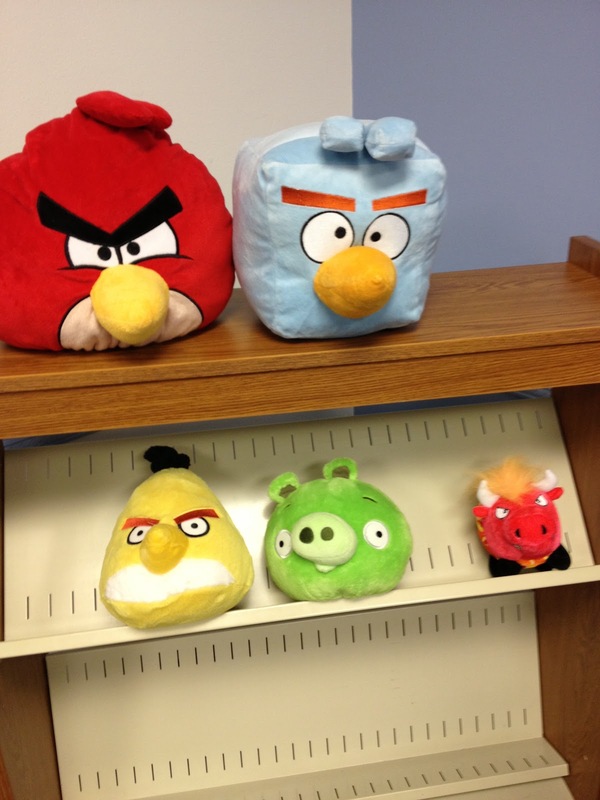 My Angry Birds! program took place on a day off of school--translation: no one had recess--that also happened to be a frigid day here in Missouri--translation: no one had left home or burned off any energy at all prior to coming to the library. We had a massive number of kids and their grownups come into the program room (final count was around 57 people), and they anxiously awaited the go-ahead from me to pick through the tables lined with building materials and get to knocking things down. I had the best of intentions of making the STEAM elements of this program explicit in my program introduction: I mentioned the engineering inherent in building towers, the science of projectiles, the creativity of making crazy structures. I had the kids' attention for maybe five minutes before their pent-up energy demanded they be allowed to construct and destroy. 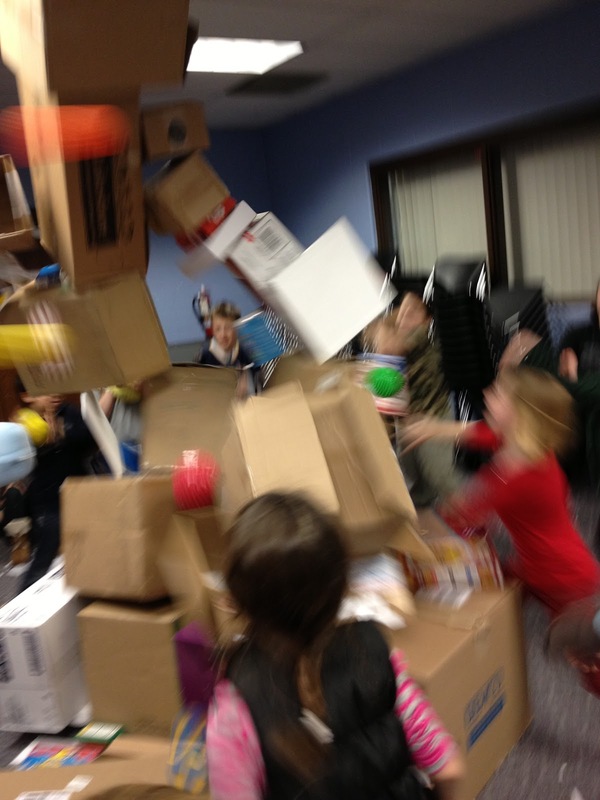 Our 45 minute program featured rapid cycles of tower-building and destruction. I initially encouraged the children to form small groups to create small towers; once they were satisfied with their towers, they worked together to project an Angry Bird at it to knock it down. 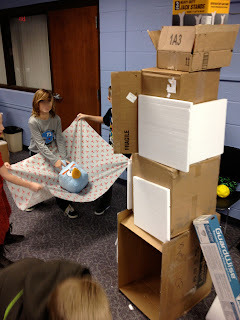 I then encouraged them to pair with another group to try to build a larger, more structurally sound tower that wouldn't be knocked over by just one projectile. They happily obliged, building structures with solid foundations, but soon the cheers accompanying the destruction overshadowed most of my attempts to provide further guidance. They were having fun, though, so I didn't worry. Finally, with just eight minutes left in the program, I shouted out the final instructions: children would form a total of three teams, and each team would strive to build the tallest, strongest tower. Then we'd all watch the demolition efforts together. All three groups made massive towers that touched the ceiling tiles--parents put small children on their shoulders to get the final pieces atop the towers. I was impressed by the dedication to the challenge. The only way I can think to explain the last moments of the program is to say that hive mind kicked in. Somehow, without any instruction from me and without any oblique communication, every child picked up a ball. Then every child aimed. Before I knew it, someone was counting down, and after that 3-2-1, every child threw his or her ball at the tall, tall tower, which immediately came crashing down. The next thing I saw was a room full of maniacally laughing children, pieces of recyclables scattered at their feet, holding bits of cardboard and styrofoam over their heads and tearing them to tiny pieces. Total chaos, yet total joy. So many smiles as families left. So much vacuuming after they were gone. So I would say, librarian friends, that in my experience an Angry Birds program is not for the faint of heart, especially in the winter. If you aim to offer one, look to those bloggers linked in the intro who seemed to have a calmer time of it. Yet all the mayhem of that evening was worth it, especially when a few kids stopped by the next day to say how much fun it was to build things at the library. It just goes to show that the things you build needn't be permanent for the enjoyment and informal learning to last.